Checkout the businesses at street level. arrows to walk up and down the streets. note: Blocks on map below are active links. Click here to read some of the e-mail that you have sent us! Historical Downtown Mobile Alabama has much to offer. Rich in history, beauty and Southern Charm. Mobile Alabama has everything needed to host successful conventions, interest tourist and locals alike. 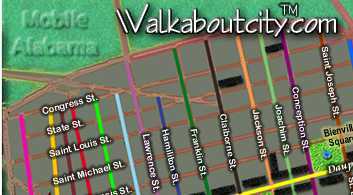 We are proud to say that WalkaboutCity is growing everyday while we add businesses and information on city events and interests. Keep checking back on Downtown Mobile and you will be delightfully surprised in WalkaboutCity's progress in offering it's visitors the one stop website to visit and shop and to keep up with what's going on in Downtown Mobile Alabama! If you are interested in learning more about the history of Mobile, we suggest that you visit The Center of Archaeological Studies website at The University of South Alabama. Through years of research they have loads of information for all ages!